What Day Of The Week Is October 17? 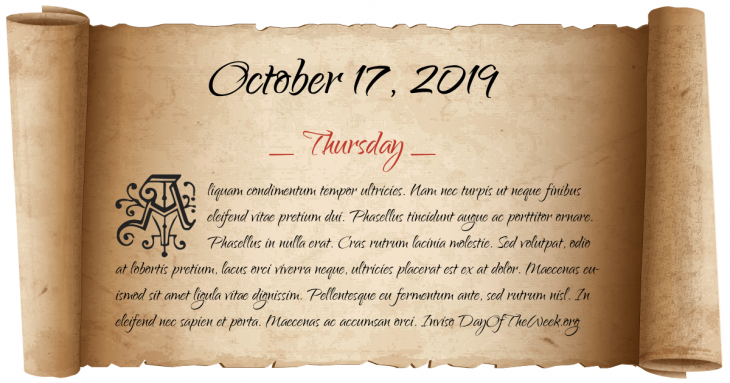 October 17, 2019 is the 290th day of the year 2019 in the Gregorian calendar. There are 75 days remaining until the end of the year. The day of the week is Thursday. Premiere in Milan of the opera Ascanio in Alba, composed by Wolfgang Mozart, age 15. London Beer Flood occurs in London, killing nine. For the first time in World War II, a German submarine attacks an American ship. Scores of Algerian protesters (some claim up to 400) are massacred by the Paris police at the instigation of Nazi collaborator Maurice Papon, then chief of the Prefecture of Police. A fire at a building in New York, New York kills 12 firefighters, the New York City Fire Department’s deadliest day until the September 11, 2001 attacks. Botswana and Lesotho join the United Nations. OPEC starts an oil embargo against a number of western countries, considered to have helped Israel in its war against Syria. Who were born on October 17?